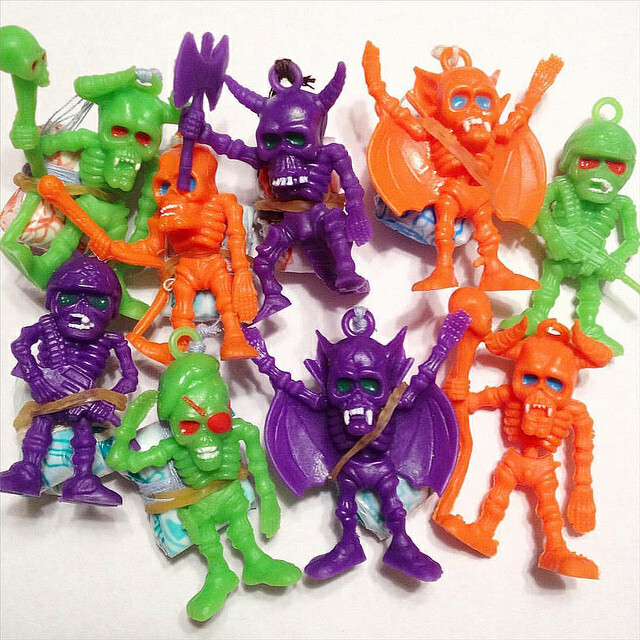 Here are some awesome parachuting skeletons that I probably got sometime in the early '00s. They're a unique twist on the Imperial Poopatroopers that have been sold in one form or another for decades. I can't remember exactly where I got them or how they were sold, other than I bought them new in a physical store. My best guess would be that they were released as party favors around Halloween -- possibly at Target. I don't think I've ever seen them show up anywhere else online. 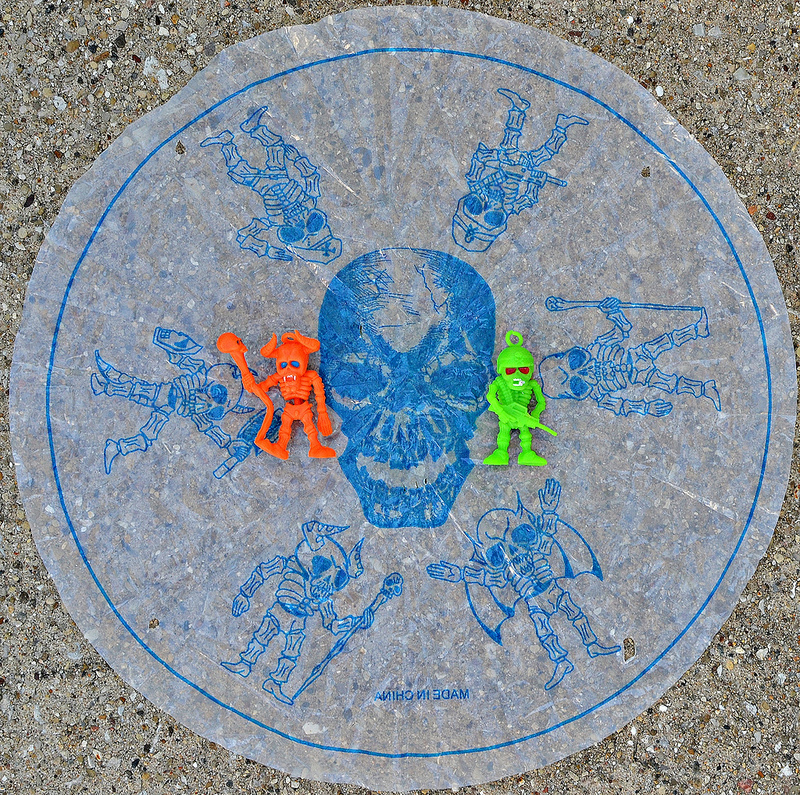 The figures are about 1.5 inches tall and made of flexible soft plastic. There are six different sculpts that come in three different colors -- orange, green and purple -- each with a bit of painted detail. 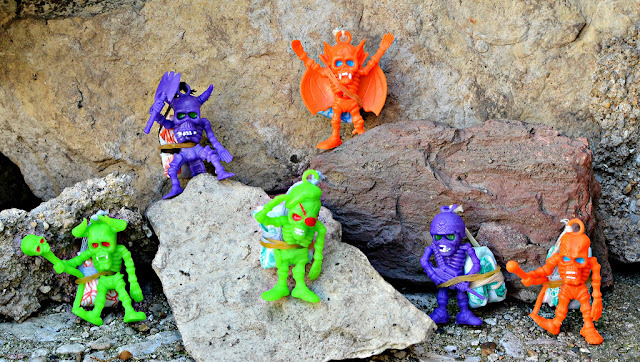 The sculpts are really well done for being cheap toys, and you can tell whoever designed them had fun with it. For example, the helmeted skeleton has a tiny cigar sticking out of his mouth, and the skeleton holding the axe has a creepy-lookin' bone tail. 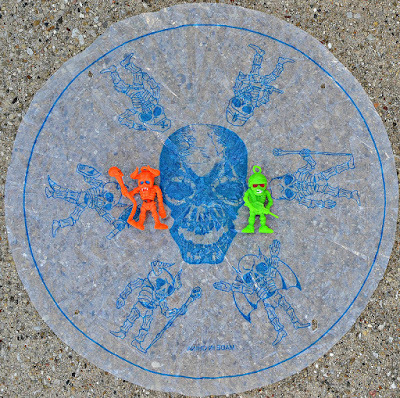 To add to the fun, the thin plastic parachutes attached to the figures aren't just plain white -- they have graphics printed on them depicting each of the 6 skeleton dudes as well as a big skull head in the middle. Rad. These are definitely some of the coolest party favors I've seen. I just wish I had bought more of them! Has anyone else come across these skeleton paratroopers before, or know anything more about them? They're lovely! I've never seen them before either! More gobs of plastic, yum! Man these have to be some of my favorite party favors. I've seen some of the sculpts pop up in vending machine header cards every now and then, but never in such great colors. Yeah, between the sculpts and the colors they definitely stand out. Wish I could go back in time and buy a bunch more packs for a buck or whatever cheap price they were. These look really cool :). Question, do you have any more pictures of the gargoyle like one (the one with the wings) I just think that one looks awesome. These are the only pics I have as of now, but you should be able to see a closeup by clicking on the second photo in the post.